The England women have whitewashed India by 3-0 in the T20I series as they won the nail-biting last game by just one run. The match went all down to the last over in which Kate Cross gave away only one run and picked up two wickets to ensure another win for the visitors in Guwahati. 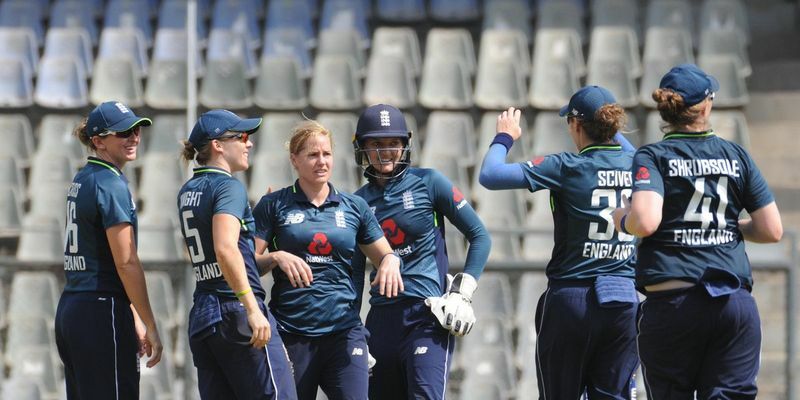 After having won the T20I series already, the England women’s team won the toss and opted to bat first in the third game at the Barsapara Cricket Stadium, Guwahati. The two openers Tammy Beaumont and Danielle Wyatt, who have done well in the series, started off on a positive note again in today’s game as they added 51 runs for the first wicket. However, the duo couldn’t continue with their partnership after the powerplay period as Anuja Patil gave the crucial breakthrough for the Indians by sending back Wyatt for 24 in the eighth over. The visitors lost two more wickets in the next two overs when Poonam Yadav got rid of Natalie Sciver for a duck and Patil sent back the other opener Beaumont (29) as well. Amy Ellen Jones then tried her best to get the England team out of troubled waters and Heather Knight (11) also hung around at the crease with her. Jones was the last batter to be dismissed as she was picked up by Harleen Deol for 26. Sophia Brown and Anya Shrubsole remained unbeaten with scores of 14 and 10 respectively setting a 120-run target for the Indians to chase down. Playing for a consolation win in the T20Is, the Indians were off to a terrible start again as they lost the wicket of Deol as early as in the second over of the innings. Smriti Mandhana and Jemimah Rodrigues batted well after that and India crossed the fifty-run mark with nine wickets in hand. Linsey Smith broke the second-wicket partnership by sending Rodrigues back for 11 which gave England an opening to come back into the contest. The ODI skipper Mithali Raj joined Mandhana in the middle hoping to take India closer to the target. Mandhana looked sublime in his batting and also got to her ninth T20I fifty before getting out to Laura Marsh for 58 off 39 balls. India lost the wicket of Deepti Sharma in the 16th over when they needed only 25 more runs to win. With nine needed of last 12 balls, India got six runs in the penultimate over as Raj struck a four off the last delivery of the 19th one. However, the hosts lost the wickets of Bharati Fulmali and Anuja Patil in the fourth and fifth delivery of the final over respectively as Cross didn’t give a single run till the final ball. With Raj stranded at the other end, Shikha Pandey got only a single off the last delivery as the English women managed to defend the total to win the series 3-0 in Guwahati. Cross won the Player of the Match award while Wyatt was crowned Player of the Series.